Thomas Shannon, U.S. undersecretary of state for political affairs, testifies about recent Iranian actions and implementation of the nuclear deal.at a Senate Foreign Relations Committee hearing on Capitol Hill in Washington, April 5, 2016. A U.S. official on Tuesday denied reports that the Obama administration would grant Iran access to the U.S. financial system, but said Washington would help Tehran gain full benefits from sanctions relief under last year’s international nuclear accord. “Rumors and news that has appeared in the press that the U.S. is preparing … to allow Iran access to the U.S. financial system are not true,” Thomas Shannon, undersecretary of state for political affairs, said in testimony before the Senate Foreign Relations Committee. Lawmakers repeatedly pressed Shannon about comments made hours earlier by Secretary of State John Kerry on a U.S. cable network. Foreign Relations Committee Chairman Bob Corker, a Tennessee Republican, asked Shannon for reassurance on the matter. 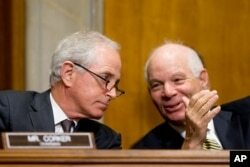 Chairman Bob Corker, R-Tenn., left, and ranking member Ben Cardin, D-Md., confer as the State Department's Thomas Shannon testifies at a Senate Foreign Relations Committee hearing on Capitol Hill in Washington, April 5, 2016. Senators of both parties also urged a more vigorous response to Iranian missile launches conducted in violation of a U.N. Security Council resolution. “Hard-liners in Iran lost on the nuclear issue," Shannon said. "They are intent on doubling down on the ballistic missile program. So we can expect more launches. “But in that regard, we are very intent on doing everything we can to deter and delay that program, and at the same time work with our partners in the region to ensure that they can protect themselves,” he added. Corker said his initial fears about the nuclear accord had come true. “We [opponents of the pact] were concerned that we were giving away leverage — that on the front end, Iran would get all of this relief, and then we would be on the eggshells — that the administration would be concerned, if we push back, they might walk away, since they got everything they wanted on the front end,” he said. "That’s not the case,” Shannon insisted. “We just want to make sure that as Iran meets its commitments, we meet our commitments." “As we look at Iran’s behavior, broadly in the region, we are concerned by it, we are appalled in some instances by it, but we are working actively to push back on it and to stop it where we can,” he added. On MSNBC, Kerry said that while Iran remained a threat to the Middle East and beyond, the severity of that threat had been reduced by the nuclear accord. “It [Iran] will not have a nuclear weapon,” he said.